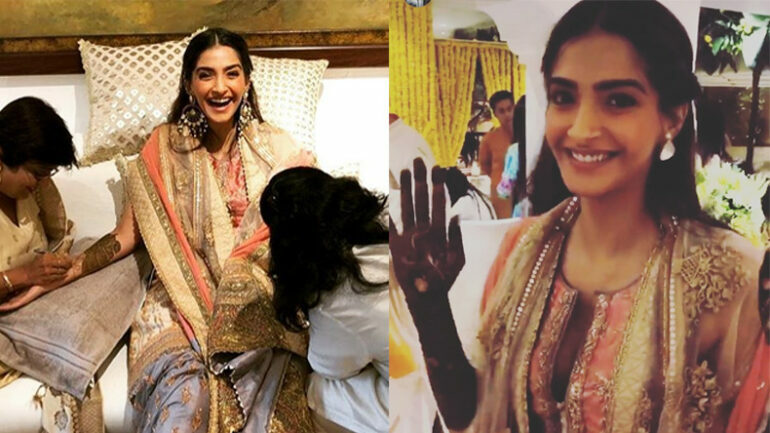 As Sonam Kapoor and Anand Ahuja finally tied their knot yesterday by following traditional Sikh Rituals, the whole internet is buzzing about their Mehandi, the Grand Wedding, and After Wedding Reception Party! Let’s know everything about the three-day starry affair from Mehendi to Reception party! Sonam Kapoor, being a stunner wore a gorgeous white colored lehenga by Abu Jani Sandeep Khosla which was specially designed for her Mehendi. Sonam’s pre-Mehendi party has happened on last Sunday. Undoubtedly, the bride-to-be was looking absolutely stunning on her Mehendi. With a sparkling kundan choker & matching earrings, she was the center of attraction of her Mehendi Ceremony. Anand Ahuja was wearing traditional wear at the Mehandi. At Sonam’s Mehandi Ceremony, Janvi Kapoor and Khushi Kapoor were among the first guests who arrived at the venue while Anil Kapoor and Sonam’s brother Harshvardhan Kapoor were at the venue gate for welcoming the arriving guests. The Grand Wedding happened yesterday, on 8th May at Rockdale, Bandstand, Bandra which was the ultimate wedding venue. Finally, Anand Ahuja and Sonam Kapoor tied the knot on Tuesday by following Sikh rituals. Only Sonam Kapoor’s family members and close friends attended the wedding ceremony at her aunt’s house in Rockdale. Being a fashionista, Sonam Kapoor was looking radiant in her Anuradha Vakil red and golden lehenga choli. Her groom, businessman Anand Ahuja was wearing Raghavendra Rathore’s beige colored bandhgala on the wedding. The rituals of the wedding started at around 12:30 pm and ended within an hour. Father Anil Kapoor with wife Sunita Kapoor and son Harshvardhan Kapoor were very much active throughout the wedding. People who attended Sonam’s wedding were Arjun Kapoor, Boney Kapoor with his two daughters Janhvi and Khushi, Sanjay Kapoor, Mohit Marwah and other Kapoor family members. Talking about the grand after wedding reception party, the wedding reception party was organized at a five-star hotel in Mumbai and all Industry Friends of Sonam Kapoor were invited along with Sonam’s relatives, close friends, and dear ones. The newlywed coupled arrived at the wedding reception party together and were wearing monochromatic outfits. Soon after the couple’s entry, Sonam and Anand Ahuja’s family members started to arrive. Famous stars who grab the attraction of media were Kangana Ranawat, Abhishek Bachchan with wife Aishwarya Rai Bachchan, Janhavi Kapoor, Khushi Kapoor, Kareena Kapoor, Karishma Kapoor, Taimur Ali Khan along with Saif Ali Khan, Alia Bhatt with Ranveer Kapoor, Rekha, Rani Mukherjee, Shah Rukh Khan with wife Gauri Khan, Salman Khan, Katrina Kaif, and others. The newly married couple were filled with joy and happiness as then posed in front of the media. At the party, the newlywed couple cut a huge wedding cake and celebrated with joy. The guests at the reception party were dancing. In the end, good wishes to both Sonam Kapoor and Anand Ahuja as they have stepped into a new phase of their lives. We hope they will lead a happy and joyful marriage life as husband and wife!